So excited for today because we are introducing a brand new in-house illustrator! Please welcome Anna Oszvald to the Mama Elephant family! Anna specializes in floral illustrations, just check out her Instagram feed and be mesmerized! 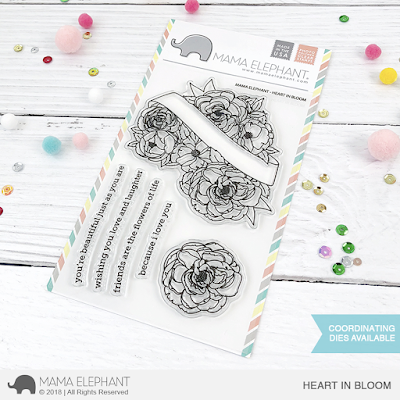 Anna first set with Mama Elephant is Heart in Bloom, a beautiful large image set that is such fun to color. A beautiful ribbon runs across that you can customize with sentiments. Also new is a full size A2 wood stitching pattern called Woodgrain Cover. 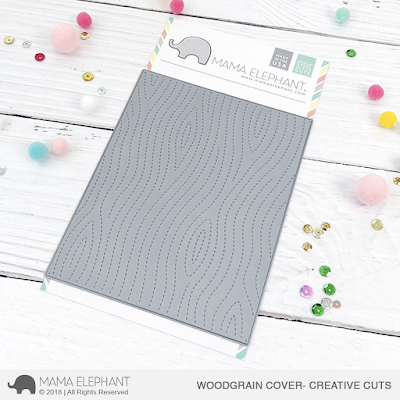 This is perfect to create a quick and fun background. My first card pairs both new products - Heart in Bloom and Woodgrain Cover. They look SO good together, don't you agree? I applied a rainbow wash over the flowers, super quick and easy and looks so bold against the woodgrain background. I created a set of 5 cards using Heart in Bloom with some artistic background splattering. I love how rustic these babies came out! 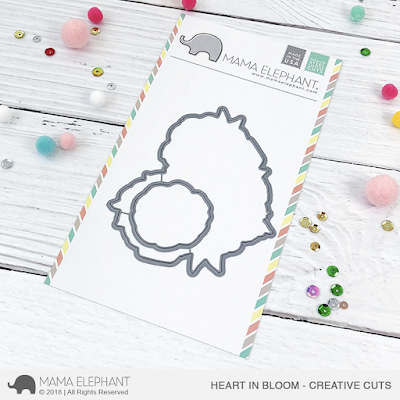 I also created a small shaped card using Heart in Bloom. Check that out for size! It's just big enough that it works as a card on its own! A gradient blue watercolor wash and it's done! Last but not least, using the smaller flower, I created my own background paper. I laid a vellum over it to soften the look. The notches to hold the (very outdated) gift card is from the new FT - Waverly. oh man, the babies r us gift card gave me tears. So sad the company went bankruptcy. But the card is nice! Oh I love that wood grain die!!! Oh I need that Heart in Bloom!!!!!!!!!! Wow!!! Heart in Bloom is GORGEOUS!!!! !